Newport News, VA - Last night, Liberty Counsel filed a response countering GuideStar's request to dismiss the lawsuit against it for intentionally damaging Liberty Counsel's reputation by falsely labeling it a "hate group." It is clear this case should continue. GuideStar intended to damage Liberty Counsel's reputation in the mind of the public and especially current and potential donors. This politically-motivated label has exposed Liberty Counsel to potential violence and even death threats, causing additional expense increasing security to protect its staff from an attack similar to the one against the Family Research Council in 2012 and that one that seriously injured Representative Steve Scalise, who was discharged from the hospital less than two weeks ago. The case has a very low standard to meet to continue. Precedent states that even if proof is "improbable" and "recovery is very remote" that a "well plead complaint may proceed." Liberty Counsel's case significantly surpasses this low bar with accurate facts and harm caused by GuideStar's reckless action. GuideStar presented the "hate group" label as "fact." GuideStar issued a statement saying it will continue to provide the SPLC "hate group" information upon request and is considering other ways to distribute this incorrect information to the public. Though after receiving a letter confronting GuideStar's false label, it temporarily removed the label from the pages of conservative nonprofit groups. However, the damage already done by GuideStar is far reaching because this lie has been spread through scores of media sources and widely published on the internet. "If GuideStar has nothing to hide, why is the organization so desperately fighting the discovery phase of our lawsuit? GuideStar and its CEO Jacob Harold presented the 'hate group' label as 'fact' in an attempt to harm Liberty Counsel. This 'hate group' label is false, defamatory, and dangerous," said Mat Staver, Founder and Chairman of Liberty Counsel. "There are unstable people who have listened to this reckless rhetoric and used it to justify physical harm and even attempted murder because of these false, politically-motivated labels. GuideStar is playing with fire, and other innocent lives will be hurt by its reckless allegations. Liberty Counsel is not a 'hate group' and opposes violence," said Staver. GuideStar used the Southern Poverty Law Center(SPLC) false and dangerous "hate group" designation by placing its logo and rhetoric, which states "This organization was flagged as a hate group by the Southern Poverty Law Center," on Liberty Counsel's page within their website. GuideStar placed the same 'hate group' label on 46 nonprofit organizations that all share a professional, peaceful conservative view on marriage. The SPLC's caustic and false rhetoric is dangerous because it creates a "Hate Map" listing so-called "hate groups." Mark Potock with the SPLC admitted in an interview: "Our criteria for a 'hate group,' first of all, have nothing to do with criminality or violence or any kind of guess we're making about 'this group could be dangerous.' It's strictly ideological." Mark Potok is on video in a public meeting stating, "Sometimes the press will describe us as monitoring hate crimes and so on. I want to say plainly that our aim in life is to destroy these groups, to completely destroy them..." The SPLC has now admitted James Hodgkinson, the D.C. shooter who gunned down Rep. Steve Scalise, two staff members and two U.S. Capitol Police officers, "liked" the SPLC on Facebook. In addition, the SPLC is also linked to the attempted mass murder in the 2012 shooting at the Family Research Council by Floyd Corkins II, who intended to commit mass murder and was motivated by the so-called "Hate Map" on the SPLC website. In 2016, the U.S. Department of Justice's Disciplinary Counsel for the Executive Office for Immigration Review sharply rebuked and reprimanded attorneys representing the SPLC and its allies for employing the SPLC's "hate group" label to denigrate a conservative advocacy group. It concluded that employing the label against groups with which it disagrees "overstepped the bounds of zealous advocacy and was unprofessional." It continued that such behavior is "uncivil" and "constitutes frivolous behavior and does not aid the administration of justice." 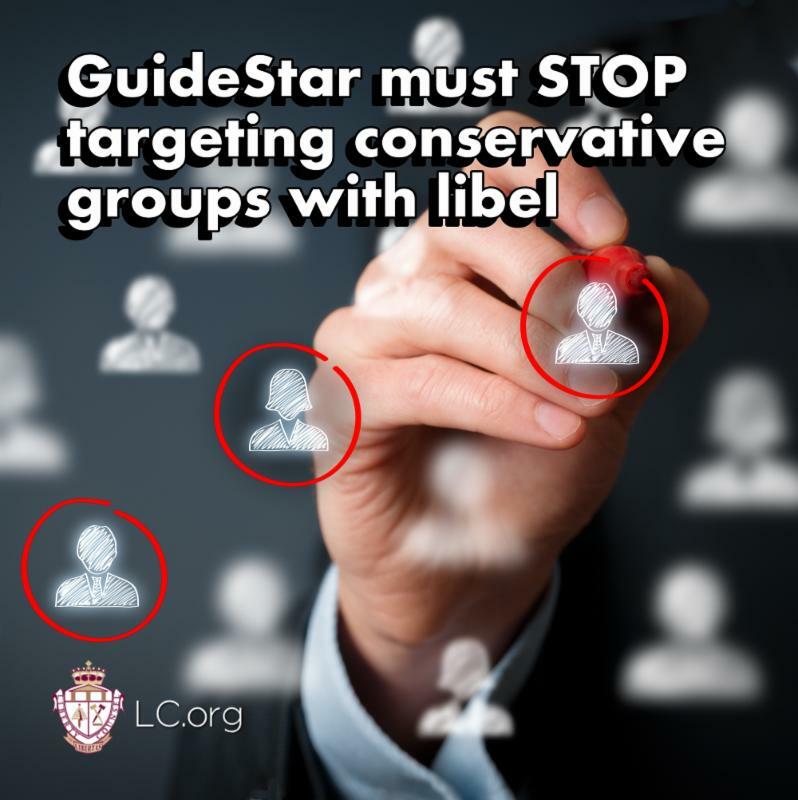 "GuideStar and its political ally, the SPLC, are intent on destroying pro-family organizations. The 'hate group' label is false and dangerous," said Mat Staver, Founder and Chairman of Liberty Counsel. "GuideStar's CEO, Jacob Harold, is using GuideStar as a weapon to defame, harm, and promote his liberal agenda by using the SPLC to falsely label good nonprofit organizations as 'hate groups.' The only purpose of providing the SPLC false and dangerous 'hate group' label is to inflict reputational and financial harm to Liberty Counsel. GuideStar has lost all credibility. GuideStar will now have to answer for its reckless, defamatory, and harmful political labeling," said Staver. Jacob Harold, GuideStar's president and chief executive officer, is a far-left liberal activist and protester. Harold tweeted a picture of himself at the so-called "Women's March" in January 2017, holding a protest sign obviously directed against President Donald Trump. This march overtly promoted abortion. His wife is also a pro-abortion advocate. According to his bio, Harold has written extensively on climate change and has further training in grassroots organizing from Green Corps. He worked for Rainforest Action Network, Greenpeace USA and Citizen Works. He also donated to the Obama campaign in 2011 before joining GuideStar in 2012. In addition, Harold's twitter account shows he is a climate change activist. Under his direction, GuideStar-published a piece that uses pro-LGBT and pro-transgender language. Harold was a host for a NARAL Pro-Choice D.C. men's event in 2014, and he blogged for Huffington Post. Laird Wilcox, founder of the Wilcox Collection on Contemporary Political Movements at the University of Kansas's Kenneth Spencer Research Library and a leading expert on "extremist" organizations, has identified the false, misleading and destructive nature of the SPLC's "hate group" designations. Mr. Wilcox has noted that the SPLC has gone into "ideological overdrive and has developed many of the destructive traits that characterize moral crusaders, including the demonization of critics and dissenters." Mr. Wilcox stated that the "hate group" designations reflect a "kind of selective attention and biased reporting" that "simply illustrates [the SPLC's] unscrupulousness." He continued that it is "pretty hard to deny that the SPLC is a political operation that is trying to tar right-wingers and conservative Republicans" (emphasis added). Wilcox also noted that "[t]he dirty little secret behind the SPLC is that they actually need racial violence, growing 'hate groups,' and more racial crime to justify their existence and promote their agenda." (emphasis in original). Wilcox concluded, "When you get right down to it, all the SPLC does is call people names. It's specialized a highly developed and ritualized form of defamation, however-a way of harming and isolating people by denying their humanity and trying to convert them into something that deserves to be hated and eliminated." He also noted that the SPLC's "victims are usually ordinary people expressing their values, opinions, and beliefs-and they're up against a very talented and articulate defamation machine." Laird Wilcox has observed of the SPLC that "[m]oralizing crusades that demonize and stereotype the opposition can be very damaging, even when they claim to be working on behalf of what objectively seems to be a 'good' cause-and the more venerated the cause the more excessive and extreme tactics are seen to be justified. Movements to right wrongs are very dangerous when they let the end justify the means." Alexander Cockburn, a columnist for the liberal publication The Nation, has labeled the SPLC and its leaders as "the archsalesmen of hatemongering." Mr. Cockburn noted that the SPLC represents nothing more than "hate-seekers scour[ing] the landscape for hate like the arms manufacturers inventing new threats, and for the same reason: it's their staple." Other commentators researching the SPLC's "hate group" label have found that there is a "serious objection to the SPLC's hate list" because of "the loosey-goosey criteria by which the [SPLC] decides which organizations qualify as hate groups." The SPLC has been charged with "being willing to slap the hate label on groups that may merely interpret data differently from the SPLC." Foreign Policy Magazine has been harshly critical of SPLC's "hate group" label, noting, "The problem is that the SPLC and the ADL (Anti-Defamation League) are not objective purveyors of data. They're anti-hate activists." Foreign Policy concluded that the methodology used by the SPLC is fundamentally flawed, and that "[i]f there is any lesson in all of this [hate group labeling], it's that the study of domestic American extremism shouldn't be the exclusive province of activists." Other commentators have noted that "[w]hen an organization as prominent and powerful as the SPLC turns its guns on you, it can cost you your job, your livelihood - even your standing in the community. Not because you have done anything wrong. Not because what they say about you is true, but because a focused vilification campaign forces others to avoid you out of fear. You become what they call 'radioactive.'" The Philanthropy Roundtable has noted the SPLC's "hate group" designation is "not a Consumer Reports Guide. It's a political tool." The Philanthropy Roundtable also noted that the SPLC is a "notoriously partisan attack group" and that its "hate group" designations are intended solely as a fundraising tool and that the "hate group" designations "spread stigmas just by innuendo" and that the SPLC has an "utter lack of any reasonable criteria for who goes on its lists." The Philanthropy Roundtable concluded that "[i]t is entirely fair to disagree with any of these charities or individuals-but utterly unfair to insist they are hate criminals" merely because the SPLC disagrees with them. It also concluded that the SPLC is a "bullying organization that aims to intimidate and even criminalize philosophical opponents" and that "the SPLC's tactics lead directly to hate and violence."